The honour killing that shocked Britain – by the sister who fought for justice. I picked up 3 books from Swindon central library – Shamed by Sarbjit Kaur Atwal, City of Joy By Dominique Lapierre and The time keeper by Mitch Alboom. I started with Shamed. First of all, I am little bit disappointed with the cover photo of the book. It’s a typical picture of an Asian woman’s face covered in veil. It’s hard to tell the difference from a Muslim woman. In my opinion,the cover of the book could have been more creative than this. 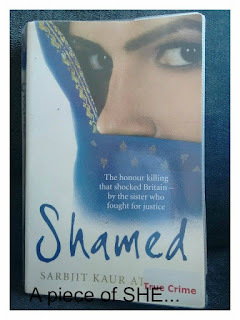 This book is based on a true crime written by Sarabjit Kaur Atwal, a Birtish Sikh woman and prime witness of her sister –in- law’s murder. Sarbjit was born in Hounslow, West London. The sikh families in their community including Sarbjit’s family was expecting a boy. Sarbjit’s arrival meant more hard work for them. Her father, being the head of the family, decided that she must learn the “Indian ways” by the time she turned 10. They believed that “Indian ways” would bring her good husband which in return would bring “honour” for their family in their sikh community. For that, she was sent to India. She lived in her father’s house with the unknown relatives, away from her parents and siblings for two years. Cooking, washing, cleaning etc was part of her training which she had already learned from her mother in London. After returning from India, she resumed her studies after a long gap. By the time she turned 16, her father started looking for suitable matches for her. Again, to bring “Honour” for their family. She had no say in choosing her own life partner. She was married off at the age of 19. If life was difficult before marriage, then it was hell after it. She thought at least she had better husband but soon she realized that he was just spineless and dances on his mother’s tunes, just like his elder brother. In 1998, Sarbjit’s sister-in-law went to India for holiday with their mother-in-law. She never returned back from that trip. Their mother-in-law had planned her murder in London in front of other members of their family including Sujit’s husband and Sarabjit. Her crime was, she was not happy with her married life and wanted divorce from her husband. She had bought “shame” in the family, according to her mother-in-law. She had to die. The book is divided in two parts: Honour and Shame. Narration style is engaging and simple. You’ll find it hard to put it down. You might have seen or heard about it in media but here you’ll get to know Sarabjit’s side of story. Why she took 7 years to tell the truth? How things work in Sikh community and more. One thing what I felt while reading this book is that through this book Sarabjit tried to took of a heavy load from her heart. I felt, somewhere she feel guilty for keeping silent for seven years and result of that is this book. Do I recommend? - Yes!